This is an old stand by recipe for us; we’ve made it for years. It makes a lot and can be eaten in a variety of ways so it is great to make when you know you will need some leftovers to munch on later in the week. I am not sure where the original came from, but here is my version. Heat the oil in a large skillet. Add the onion, peppers and spices. Saute for 2-3 minutes. Add the beans and tomato sauce and 1/2 can of water (1/2 cup). Bring to a boil, then reduce heat and simmer for approximately 20 minutes. Serve with hard taco shells, soft corn tortillas, or if you aren’t gluten free, flour tortillas. 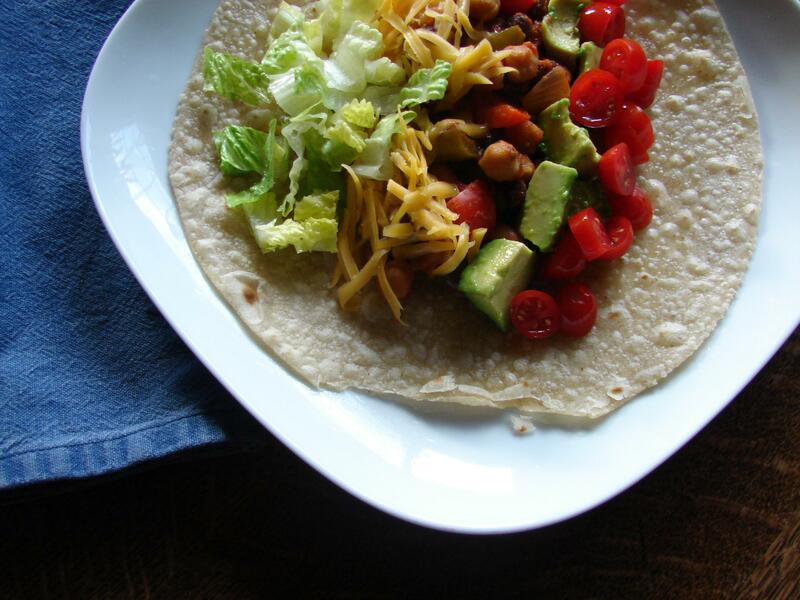 Add your typical taco toppings like lettuce, tomatoes, cheese, avocado, sour cream, hot sauce, salsa – whatever you like. In the picture above, I used a Brown Rice Tortilla from Trader Joe’s. They are pretty good, be sure to heat them in the microwave for about 30 seconds. I also enjoy eating the leftovers heated with some shredded cheese on top and some corn tortilla chips to scoop it up. I have also been known to make a taco salad out of it; just make a bed of lettuce, heat some of it up and place on top of the lettuce and sprinkle with cheese. Add whatever other salad topping you like. * Sometimes I use all regular chili powder, sometimes I substitute part of the chili powder with chipotle chili powder for a slightly different flavor. * Our usual mix of beans is 1 can of pinto beans, 1 can of chickpeas, and 1 can of black beans, but you can mix it up with whatever you have in the cabinet, kidney beans, black eyed peas, cannellini beans, etc. Hey sis, this recipe sounds great! Shannon likes the idea of putting the avocado in there! I can’t wait for the recipe’s with Schroeder honey! Let me know if you try it! I love avocados!! Honey is best on plain Greek yogurt with fruit! Hopefully we can harvest some later this year and it will be good.